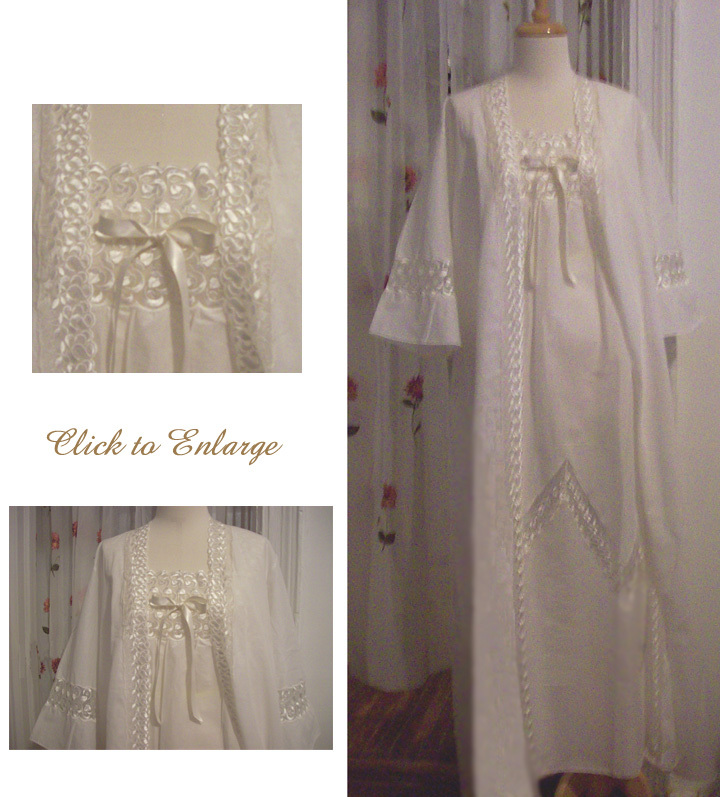 Beautifully romantic fine cotton voile ivory nightgown and robe with elegant embroidered lace trim. This is a very fine quality cotton voile with a very fine quality hand made lace trim. They have a beautiful texture and drape. The lace is a luxurious embroidery on tulle and is hand made of polyester and glossy cotton. This is truly an investment piece that you can wear often for your own comfort and sense of well-being or keep it for those very special occasions. Completely made in Italy with the quality workmanship, rich heritage and attention to detail for which the Italians are known. More and more Americans are learning from the Europeans the value of quality nightwear, so we here at Pampour want to bring these types of products to you so that you too can enjoy the comfort and luxury of better quality fabrics and construction. This model has a very generous fit. It is so luxurious you'll want to wear it every night! Nightgown is sleeveless with 3" wide lace shoulder straps. Same lace as robe and nightgown. If you click on the picture of the item you can see an enlarged view of the item, the same holds true for any inset pictures on the item pages. In most cases you can also click on the enlarged view for an for an even larger view.